Are you upset that you won’t be seeing Don Draper & Co. returning to the small screen this fall? Yeah…me, too. At least we can all thank Netflix for streaming the first four seasons of “Mad Men” until Season 5 starts next year. Even though I’ve seen all four seasons of “Mad Men” about a zillion times (so far), I can also get my Swingin’ 60s fix from the Ramsey Lewis Trio and their incredible “Bach To The Blues” LP. 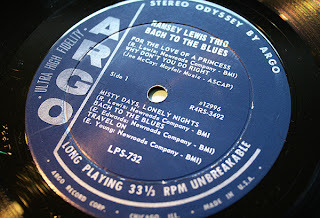 “Bach To The Blues” marks the original trio’s 16th record outing, and one of four albums the trio would release in 1964. Five of the recordings on this album are based on classical music themes, most notably influenced by Rimsky-Korsakov’s “The Love of a Princess”, Rachmaninoff’s “Misty Days, Lonely Nights”, Tchaikovsky’s “Dance Mystique” and Brahms’ “You’ll Love Me Yet.” Of course, the title track owes the obvious debt to J.S. Bach. 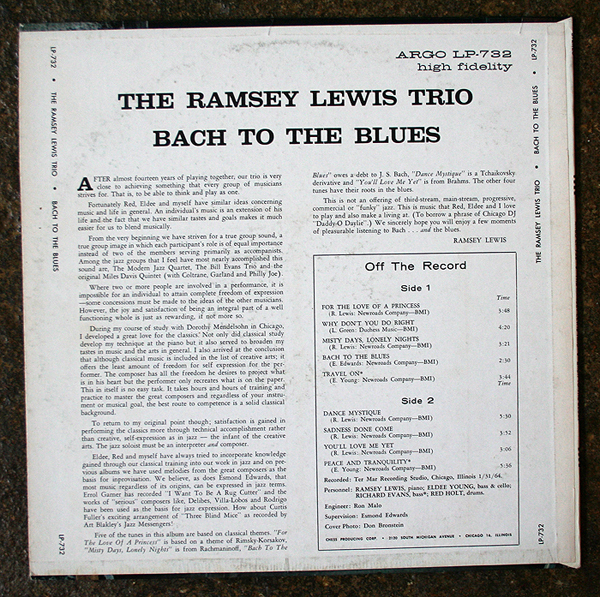 As Lewis would go onto say in the liner notes, “It takes hours and hours of training and practice to master the great composers, and regardless of your instrument or musical goal, the best route to competence is a solid classical background.” By the time this record was released, the trio had been together for nearly 14 years, and thus from their interpretations of classical music, I’d say they have quite the handle on it. The remaining four cuts are heavily influenced by the blues, like the funky piano-driven jam “Why Don’t You Do Right” and “Travel On”, where Eldee Young switches over to cello and Richard Evans guests on bass. You’ll want to cling your cocktail glasses together for these songs, as these recordings sound and feel as though they were recorded in your favorite smoke-filled club. 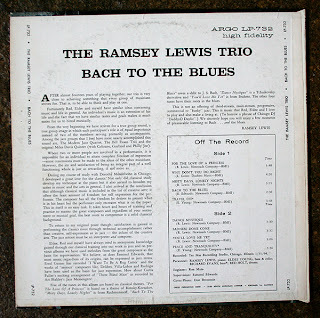 The trio makes good on weaving in and out of classical and blues influenced Jazz melodies on this record, not to mention holding their own to other groups like The Modern Jazz Quintet, The Bill Evans Trio and the original Miles Davis Quintet (with John Coltrane, Red Garland, Paul Chambers and Philly Joe Jones.) No stone (or musical mood) is left unturned. 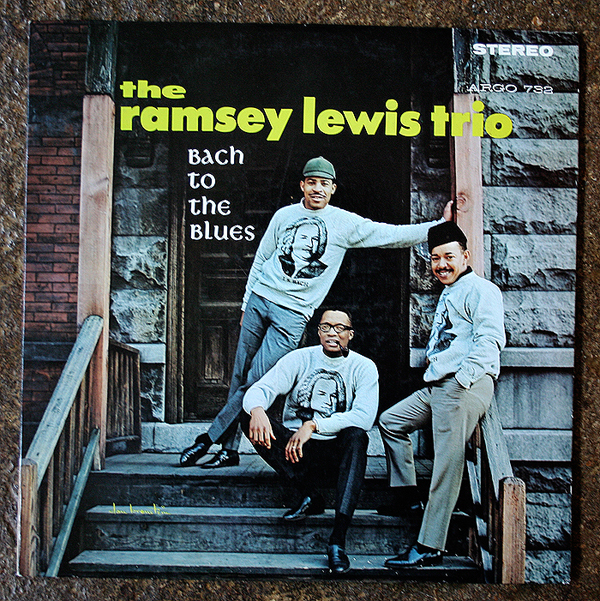 Lewis makes note of the importance of the individual jazz musician having equal importance in the group, rather than being an accompanist, and because of this fact, and because each member in the trio has similar tastes and goals, “Back To The Blues” ends up being a success on many levels. It’s obvious on this record, as Lewis further points out, that ‘satisfaction is gained in performing the classics more and more through technical accomplishment rather than creative, self-expression as in Jazz – the infant of the creative arts. The Jazz soloist must be an interpreter and composer.” This record is not just for the Jazz, blues or classical fan, casual or otherwise. This is a record that documents just how well these three musicians feel, think, breathe and play as one, not to mention paying tribute to the cats that helped shaped their musical minds and creative freedom. So, next time “Mad Men” goes on a seasonal hiatus it’s good to know there are albums like this that can carry you through until your favorite show returns. Find yourself a copy of “Bach To The Blues”, mix up an Old Fashioned or a Tom Collins and don’t feel too bad there will be no Don Draper to swoon over this fall. Oh, and by the way…you won’t be able to find this gem on CD or iTunes. Just saying. Though, if you want to get a taste of what the Ramsey Lewis Trio is about, dip your toe in the water and check out their immensely popular 1965 album, “The In Crowd”. This entry was posted on Friday, August 12th, 2011 at 9:02 am	and is filed under Music. You can follow any responses to this entry through the RSS 2.0 feed. You can skip to the end and leave a response. Pinging is currently not allowed. « Hey Dallas: Gallery Bomb Grand Opening!